A picture that did well last week was a portrait at Christie's of Henry Jermyn, an important courtier before and after the Civil War. It was being offered as Studio of 'Van Dyck', with an estimate of £60,000-£80,000. The picture was quite substantially damaged, especially in the hair and areas of the face. But overall it was a nice picture, of an important sitter. I thought that the head was almost certainly by Van Dyck, with perhaps some studio assistance in the drapery. It seemed that there might be some later oil over-paint in the hair. It is probable that the painting is a second portrait by Van Dyck of Jermyn, for there seems to have once been a full-length. The picture has been sold at auction three times in the last two years. It first surfaced at a regional auctioneer in England in 2010, making £16,000 hammer when called 'Studio (or Follower) of Van Dyck'. Then it was sold at the Dorotheum in Vienna as 'Van Dyck' in full, making EUR 76,230. And last week it made £163,250 (inc. premium). Perenyi's specialities included British sporting and marine paintings of the 18th and 19th centuries. He concentrated on the work of well-known but second-rank artists, believing that the output of the greatest masters is too fully documented. Dealers were often told he had found a picture in a relative's attic or spotted it in a car boot sale. Perhaps Perenyi's proudest moment came when a forgery of Ruby Throats with Apple Blossoms, by the American 19th-century artist Martin Johnson Heade, made the front page of a national newspaper and was heralded as a major "discovery". It later fetched nearly $100,000 at auction in New York. This painting is one of a group of paintings of ruby-throated hummingbirds that Heade painted shortly after his trip to Brazil in 1863-64. According to a letter dated January 27, 1993 from Theodore E. Stebbins, Jr., it relates most closely to Ruby Throat of North America of 1865 (Stebbins, p. 230, no. 93), and appears to be a variant of the Ruby-Throated Hummingbird in the Gems of Brazil series, now in the Manoogian Collection. The painting was recently found in Devon, England, suggesting that it may have been painted circa 1865, while Heade was still in London pursuing the Gems of Brazil project. Otherwise, according to Stebbins, it would have been painted in the following year or two after Heade had returned to New York. This painting will be included in Theodore E. Stebbins, Jr.'s forthcoming revised catalogue raisonne of the artist's work. Perenyi says that although his paintings are meant to be persuasive copies, he doesn't intend to pass them off as the real thing. "Everything is sold as a modern work of art. That's what it says on my receipt," said Perenyi, who signs his own name to the back of each work. In 2004, Perenyi claimed to have painted between 2-3,000 pictures. So Presumably there must be quite a few fakes still out there. But I like to think he wouldn't have fooled me with that dodgy Lely, above. I was once shown a painting after the Phillips of Wellington. It was under old glass and looked like a so-so copy. The medals were garbled, but the old frame and general attic dirtiness were convincing. I was asked my opinion about it, and started 'knowledgeably' explaining that the Golden Fleece was misunderstood, but it looked C19th, the labels on the back... before the grinning local hands told me it had come from China last week. I know my fascination with Van Dyck means I'm a little biased, but I thought one of the steals of the auctions this week was the above full-scale replica of Van Dyck's portrait of the Stuart Brothers [National Gallery, London]. Catalogued as 'After Van Dyck', it is by Charles Jervas, one of Van Dyck's successors as Court artist. Like me, Jervas was slightly obsessed with Van Dyck, and regularly made copies of his works. This one appears in Jervas' posthumous sale. It sold at Sotheby's for just £11,250. I was pleased, but not surprised, to see that the Saenredam View of Assendelft made a huge £3.7m at Christie's on Tuesday. This was the same picture that had nearly sold as a sleeper at Christie's South Kensington, with an estimate of £3-5,000. To their credit, Christie's mentioned the South Kensington near-miss in their catalogue, but couched it by adding that they weren't the first people to misattribute the painting. Alas, there was no mention of Art History News' role in the picture's re-attribution. Meanwhile, a Saenredam of a church interior which sold at Sotheby's New York in 2004 for $1.85m made just £713,250 this time round. Picture: La Stampa No photo after a cross email from ANSA. "We always felt it was impossible that Caravaggio left no record, no studies in the workshop of a painter as famous as his mentor," Maurizio Bernardelli Curuz Guerrieri, artistic director for the Brescia Museum Foundation, told Italian news agency Ansa. There is very little evidence to go on so far. It seems most of the works are drawings; of the 100 sketches newly attributed to Caravaggio, 83 are apparently repetitions of faces or poses from his known paintings. So the possibility is there that this is a cache of optimistically attributed studies done after the paintings. It's perhaps curious that some of the drawings published so far relate to works painted by Caravaggio long after he left Peterzano's employ, like the 1601 above drawing for the Supper at Emmaus [National Gallery]. The discoverer's e-book is already available to buy, so there's no doubt about the value of the publicity. Over at La Stampa there are some photos, which aren't clear enough to begin to make an opinion. In The Mail is a report with the sceptical view of other researchers. Dear Sir, we verify on your website the publication of 2 images under ANSA copyright mistakenly attributed to La Stampa. Please remove immediately and get in touch with our commercial department to clear the rights and pay the usage on your website. This one sounds hard to believe, and apparently there will be more information tomorrow (Friday). But the Telegraph is reporting a newly discovered cache of up to 100 works by Caravaggio in Italy. More details here. Quick - find an improbably strong blond intern! It appears it's not a case of either or; looking at a photograph from the Guardian this morning we see that the 'young lovely' developed considerable muscle overnight and is now able to carry Constable's The Lock at the same time as admiring it. Good news that Christie's set another record price for a British painting. There were lots of TV cameras at the sale (above). The price matches the record for Stubbs' Gimcrack. Now this may or may not be a coincidence, for both pictures were estimated at £20m-£25m, and both were guaranteed before the sale by an undisclosed third party. A bid at the lower estimate of £20m plus buyer's premium comes to £22.4m. The Stubbs sold to the guarantor - so in that case it is almost certain that the price the buyer actually ended up paying was not in fact £22.4m (to find out how the system works, click here). So has the same happened tonight with the Constable? Who knows. I suspect it has (and it should be noted that before the sale the auctioneer announced that the guarantor would indeed be bidding on the painting, and would recieve a 'funding fee' for doing so - for which read, 'a discount'). Obviously, if the guarantor is the buyer of the Constable, then treat those 'Constable sells for £22.4m' headlines with caution. And ask yourself whether, if Christie's was a bank and the prices that pictures realised were as crucial as, say, setting the Libor rate, people might be slightly puzzled by all this. Update: Christie's have confirmed that the guarantor was indeed the buyer. "Joshua Reynolds' Omai is an outstanding work of art which has already spent more than five years overseas and I do not want to see the regime being undermined by repeated use of temporary licences, so I have refused to grant a second licence on this occasion." Constable's 'Lock' - will it sell? All eyes on Christie's this evening, to see if another record will be set for a British painter. So far, the omens for Constable's The Lock are good - there was lots of interest at the viewing from telly and the like. The picture is already guaranteed. The question is, will it sell to the guarantor, or will other bidders come forward? I hope so. But my hunch is they won't. At the National Gallery in Washington, a series of 16 Gilbert Stuarts are being restored. Quick - find a blond intern! I always like seeing how the press photograph Old Masters coming up at auction. Sometimes, you get photos of a porter pretending to hold the painting up with white gloves. More usually, a young lovely from the department is drafted in to 'admire' the painting; in this case a Rembrandt coming up tonight at Christie's, estimate £8m-£12m. The online petition about the threat to the Gemaldegalerie is doing well - this morning the number of signatures stood at about 300. Now, at 11pm UK time, the count reads 1405. Well done everyone - keep going. There was a curious story in the Sunday Times yesterday (paywall) about the above portrait of Van Dyck, owned by the Rubenshuis. Apparently, a new type of x-ray has persuaded some scholars to change the attribution to Van Dyck; thus it is a self-portrait. The story was a little garbled, and the full research has not been published yet. But the gist was that the x-rays revealed a picture beneath the portrait which was close to the type of thing painted by Van Dyck at that time. Thus the portrait on top was more likely to be by Van Dyck. The attribution of the painting has gone back and forth between Rubens and Van Dyck over the years. Personally, I always leaned towards Rubens, but not with great certainty. 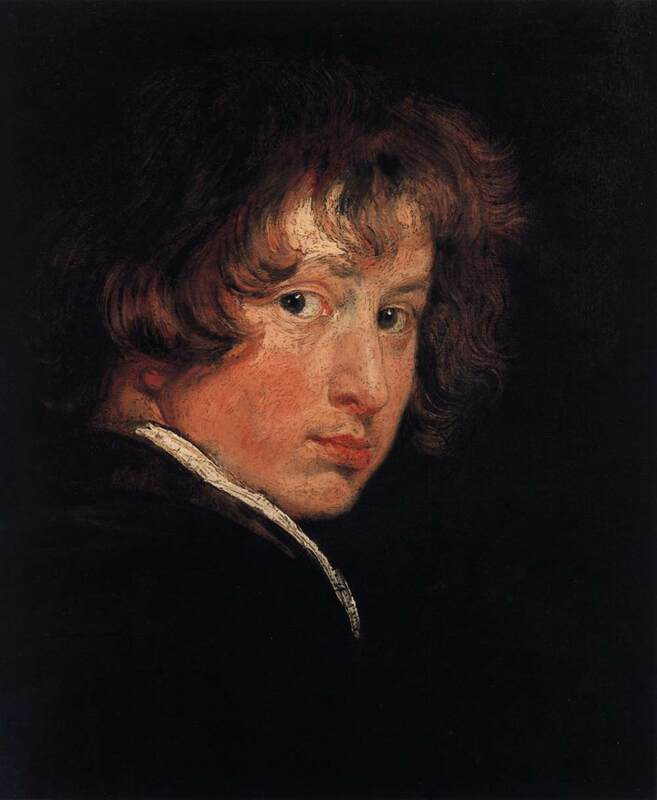 Early Van Dyck is fiendishly difficult, not least because he was a master of assimilation. Laughably, the self-appointed Van Dyck 'scholar' Erik Larsen once suggested, in his Van Dyck 'catalogue raisonne' that the picture did not only not show Van Dyck, but that it was by George Jamesone. So I hesitate to pronounce on the evidence published so far. But this is a blog, and on blogs you're allowed to be a little cavalier. So for me, the x-ray theory sounds a trifle odd. This is mainly because even snazzy new x-rays don't let you determine what a painting beneath a painting looks like to the extent that you can make an attribution. In this instance the attribution is made more difficult by the obvious fact that Van Dyck was then working in Rubens studio. Furthermore, the composition doesn't strike me as a self-portrait. It is very different to Van Dyck's own undisputed early self-portrait in Vienna. Finally, I am increasingly wary of what appears to be almost a new fashion amongst some Rubens scholars to take work from the period of Rubens' career when Van Dyck was working for him, and give it instead to Van Dyck. Such decisions often happen despite the opinion of previous Van Dyck scholars that the work in question was not by Van Dyck. So I look forward to seeing all the new evidence, but for now I stick with the opinion of many Van Dyck scholars that it is the work not of their man, but Rubens. I wish my George Jamesone portraits were nearly as good as the Rubens/Van Dyck portrait in today's blog. Jameson's work is now for the first time in years well illustrated by his room in the Scottish National Portrait Gallery, those pictures vary in condition and quality, and it is great to see them on display,but are still of course a bit provincial by comparison. In case you're in London this week, or even today (Sunday), we (Philip Mould & Co) have a small exhibition of royal portraits in the gallery, all part of Master Paintings Week. In the room above, there are 11 monarchs (14 if you count the Jacobites), 3 princesses, 2 consorts, and 1 royal mistress. Not a headline you ever want to read. At the National Gallery of Ireland in Dublin, a man punched a whole through Monet's 1874 Argenteuil Basin with a Sailboat. A gallery source has described the damage as 'very serious'. The puncher, who has been detained under the Mental Health Act, apparently had paint stripper in his bag. Is it me, or are these attackes becoming more frequent? Do we need to have a collective rethink about museum security? You're right about these attacks on paintings - and not just paintings. The newsreader's phrase 'stabbed by a stranger' leapt out at me last night from the telly. It sounded just like a category, and I thought how, these days, the news always contains at least one mindless unprovoked attack on a member of the public. Coming to this a little late I'm afraid, but worth noting that Christie's recent post-war and contemporary evening sale made £132.8m, a record for any european auction house. One of the top lots was Francis Bacon's Study for Self-Portrait (above), which made £21.5m. Prices include buyer's premium. More details, including Sotheby's results, in The New York Times. The city has been given two modern/contemporary collections, and, as is usual with these gifts, is obliged to show these collections. Since the Neue Nationalgalerie (Mies van der Rohe building) is nearby, the city thought it could just relocate the Old Masters (partly into the Bode Museum and partly into storage!!! until a new building has been built, for which there's no money), and use the Gemaeldegalerie for the presentation of these contemporary collections. This is an absurd proposal for a host of reasons, not least because it would destroy the unified presentation of one of the world's best collections of old master paintings and disband the collection for an unknown period of time. You can find more details here in the Frankfurter Allgemeine (in German), where writer Niklas Maak describes the idea as 'ein dummen Scherz' ['a stupid joke'], and warns that in Berlin's recent cultural history, 'temporary' usually means 'indefinitely'. Personally, I can't quite believe this plan will happen, but it's yet more evidence of the 'allure of the new', and contemporary art collections of dubious quality taking up space previously dedicated to more established art. Just in case, though, I'm going to go to Berlin soon; I've never been to the Gemaldegalerie, and for some reason always end up in Berlin on a Monday, when the museum is shut. Update - a reader writes to alert me to this petition, which asks Prof. Dr. Hermann Parzinger to reconsider the plans.